"Easy to make, great for dinner, leftovers and sandwiches. Adapted for our 2-person household from larger recipes for larger families with larger appetites." Mix 1/4 cup butter, garlic, paprika, Italian seasoning, garlic and herb seasoning, salt, and black pepper in a bowl. Place turkey breast with skin side up into a roasting pan. Loosen skin with your fingers; brush half the butter mixture over the turkey breast and underneath the skin. Reserve remaining butter mixture. Tent turkey breast loosely with aluminum foil. Roast in the preheated oven for 1 hour; baste turkey breast with remaining butter mixture. Return to oven and roast until the juices run clear and an instant-read meat thermometer inserted into the thickest part of the breast, not touching bone, reads 165 degrees F (65 degrees C), about 30 more minutes. Let turkey breast rest 10 to 15 minutes before serving. While turkey is resting, transfer pan drippings to a skillet. Skim off excess grease, leaving about 1 tablespoon in skillet. Place skillet over low heat; cook and stir shallot in turkey grease until opaque, about 5 minutes. Melt 1 tablespoon butter in skillet with shallot and whisk in white wine, scraping any browned bits of food from skillet. Whisk in chicken stock and flour until smooth. Bring to a simmer, whisking constantly, until thickened. For a creamier, lighter gravy, whisk in half-and-half. 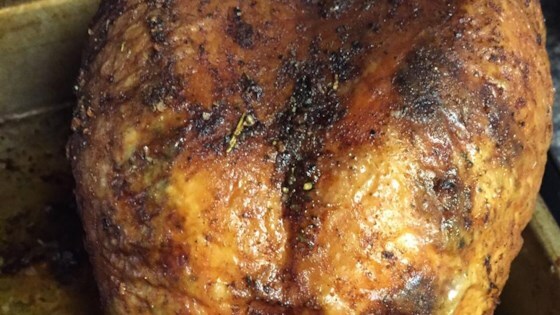 Tender, juicy, oven-roasted turkey breast. Just made the turkey without the gravy; it was a very moist turkey breast. Great for a weeknight meal, or sandwiches.